It was certainly a dramatic story. On 19th June, a matter of weeks after the anonymous crypto-currency Bitcoin began to make waves in the wider world, it experienced a crash that made the 2010 Flash Crash look like a blip. Bitcoin critics, even the normally measured Tyler Cowen, couldn’t resist a bit of self-congratulation. When things seemed to have settled down a few weeks later, the commentators started to ask whether Bitcoin was recovering from the crash. The thing is, there never was a currency crash. There was a security breach at Mt Gox, one of the largest Bitcoin trading houses, which had dire consequences for their customers. But the journalists who wanted to analyse the impact on the Bitcoin market didn’t get any further than tracking the prices at Mt Gox, the very exchange that had just been cracked, and in the process mistook a bank run for a sovereign default. Limiting their view to this, it looked like the Bitcoin economy was in ruins. 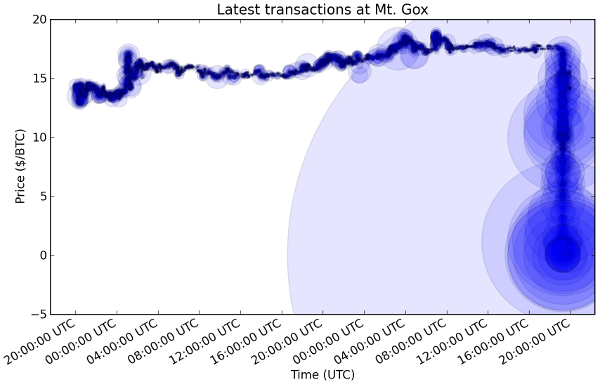 Looking beyond the Mt Gox exchange even briefly would have shown the rest of the economy was largely unaffected. Retailers continued retailing, exchanges continued exchanging, and coins that weren’t in your Mt Gox account were as safe as they ever were. If you considered Bitcoin to be a reasonable medium of exchange on the 18th of June, there was no reason to change your mind (though double-checking your encryption and backups wouldn’t be a bad idea). There seems to be one sensible message to take away from the Mt Gox crash: the cyber-criminals have arrived. If Bitcoin ever was lucky enough to fly below the criminal radar, it certainly no longer is. Optimists will probably say that this moment was inevitable, and may even validate how seriously it’s being taken. Bitcoin has very real, very interesting economic and usability difficulties that probably mean it will never be a viable currency. Suggesting that the recent security flaws in a single exchange undermine it is just lazy journalism. This entry was posted in Business, Internet on July 4, 2011 by admin.